Satellite pictures of the planet, taken from January-December 2005. Pretty interesting to see which places that gets snow, and how long the snow stays on the grounds etc. Neither Copenhagen-Malmö or Shanghai got any snow that year apparently. The rest of Scandinavia sans parts of the Norwegian coast was snowy from December to February though. If it wasn't for the Gulf Stream, Northern Europe would be pretty much unhabitable. 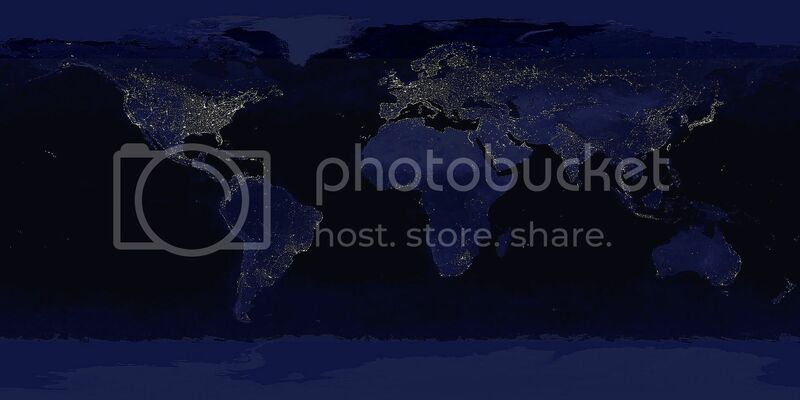 BONUS: The classic "Earth at Night"-image. Thanks for the pictures. It's interesting, also, to see the difference in vegetation (I'm looking at the eastern US in particular) between winter and summer - brown vs. green. If you look at California's central valley you can see the trend is the inverse as the rest of the country. Green in winter, brown in summer. where is the source for these great photos? Im surprised how little snow western Europe has, if you look at where London is you can see how it would be iced over if it was at the same latitude in North America. I also find it interesting to see that in December British Columbia is mosly snow except for Greater Vancouver and the Island. Although its worth pointing out much of that snow is likly on mountian tops since the province is pretty much all mountains. Originally, I would guess NASA - but they were posted by a fellow forumer in the Scandinavian Section over at SSC. The reason of the lack of snow in Europe is spelled Gulf Stream. The Fjords in northernmost Norway (above the arctic circle) never has ice on them, for example, and in a city like Copenhagen which is located way north compared to any major North American city, snow is practically unheard of. Pretty neat... Strange to see that Ottawa doesn't have snow in any of those photos! I ate your kids. Sorry. I'm wondering about the lack of green in Florida in January, as if to dictate that Florida is more deciduous than it is. South East Brazil is green in January/February and brown in July/August. I never realized how much more populated Alberta is compared to the rest of the NW of NA. Yup, pretty much all of British Columbia, Washington and Alaska is mountainous and its not so suprising that the coast range is pretty much covered in ice and snow year around. The fact that western europe is relativley snow free is not that suprising to me. Most of Western europe is not very mountainous, and it is much more mild then places in the United States at the same lattitude due to the fact that it is surrounded on all sides by water. Plus as someone already mentioned the jet streams moves from west to east. A city like London or Copenhagen which is much farther north then most American cities is way more mild in the winter time. 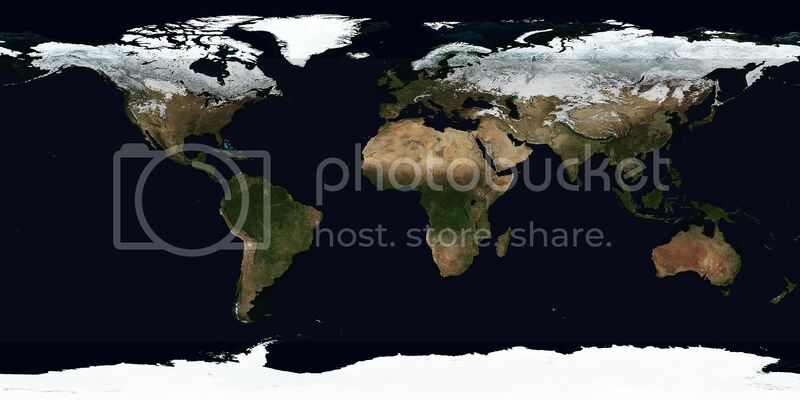 Consquently the east coasts of most continents tend to have drier colder winters. Last edited by Touray; Dec 8, 2006 at 7:04 AM. What's even more cool than those pics... is downloading/installing Google Earth 4... then locating and downloading a NASA layer for GE4 depicting the similar stuff as above...except in a movie mode that is set to repeat itself. Get the movie going... and then spin the globe. It's super super cool! - Think Big, Go Big. Think small, stay small. - Don't get sucked into a rabbit's hole. - Freeways build sprawl. Transit builds cities. The last shot is great. You can clearly tell where North Korea is on the last shot. Absolutely cannot be accurate. Its showing generally more snow in southern michigan than the northern section. Not once during my life has that ever happened. -Grand Rapids Metro, 1.4 Million strong. -FerrariEnzo is the coolest forumer ever. the picture is generally accurate as to where most snow resides at any given time during the year. I think what appears to be less snow is really places where snow is obscured by forest. Notice how the prairie provinces in Canada are solid white in the winter (few trees) while to the north and east, the heavily wooded areas are darker.